This is a limited 3-day only sale that will expire at midnight on Sunday, January 2, 2010. Click here to buy now or for more information about the deal. Quantities are limited so don’t miss out! Limit 2 per person, may buy 1 additional as a gift. Registration required. Must be 18 or older. Non-transferable. 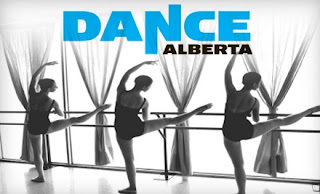 Today’s Groupon: for $25, you get an adult four-pass card good for classes at Dance Alberta (up to a $67.50 value) on 107 Avenue. For almost 40 years, Dance Alberta has dispensed professional dance instruction to children and adults of varying skill sets. Flash your four-pass card to acquaint yourself with ballet, tap, jazz, or hip-hop through four sessions of the same toe-tapping genre. Let loose for an hour (or one hour and 15 minutes for ballet) of jovial cardio with the mosh-mode of your choosing. Take a peek at the winter schedule for session dates and times. 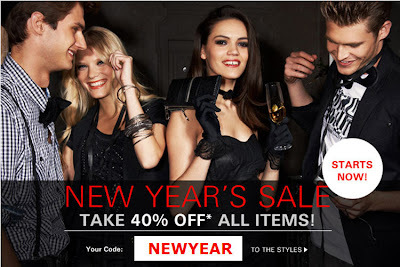 Esprit Canada currently has a Take 40% Off All Items New Year’s Sale from now until January 2, 2011. Simply enter the discount promo code “NEWYEAR” at checkout to get the discount. This sale is available online only. Click here to shop Esprit Canada now or for more information about the sale. This is a limited 5-day only sale that will expire at midnight on Monday, January 3, 2011. Click here to buy now or for more information about the deal. Quantities are limited so don’t miss out! Includes 2 litres of soup, 6 Rosemary Garlic Bread Sticks, 2 Cup Cakes in a Jar (Apple Crumble and Campfire Rocky Road), a jumbo porcelain spoon and a $5 credit towards any future package. Taxes Included. Shipping not included. Redeem using your TeamTicket Code online. Pick up available by phone arrangement only. The staple diet for the sick and toothless, chicken soup also makes a great place for stressed out crackers to take a hot, relaxing bath. Let your taste buds and stomach soak in the heartiness of home made goodness with today’s TeamBuy: for $23 you get $56 worth of home made soups, cupcake creations, and more from the Yummy Tummy Soup Company. Today’s buy does not include shipping but can be used for pickup at the conveniently located Queen St shop. Just phone ahead to arrange a pickup time. Taxes are also included! The Yummy Tummy Soup Company provides Torontonians with an alternate, thought filled gift for those sick and hungry individuals in your life. Signature Yummy Tummy chicken soup is made from scratch, using only the freshest and wholesome ingredients for a truly special meal. Compliment any nourishing meal with Yummy Tummies signature cupcakes in a jar as well as bread sticks, that are made fresh daily. The “Best Ever Apple Crumble CupCake in a jar” and the Campfire Rocky Road Cupcake in a Jar are sure to be a hit amongst recipients. These soft, moist, and delicious desserts are a perfect pair to a piping hot bowl of Yummy Tummy’s nutritious soup. With delivery available Nation wide, the Yummy Tummy Soup Company can be given to local and long lost loved ones. Personalize any order with a note to accompany your soup package so that recipients know who this tasty care package came from. Each Yummy Tummy parcel comes specially packaged in a gift box, which will be delivered right to the door, cellar, or cave of your special sick somebody. I just got an email from Sportschek and it looks like they extended their Boxing Day Event until January 3, 2011. During the sale, you can save up 50% off their regular prices in-store and online. Off our regular and in-store ticket price. Excluding items already marked down. Does not apply to previous purchases, gift cards and online gift certificates. 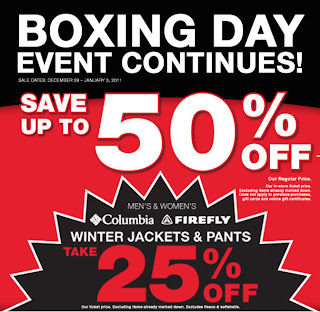 You can also take an extra 25% Off Men’s and Women’s Columbia and Firefly Winter Jackets & Pants. Click here to shop Sportchek online now. 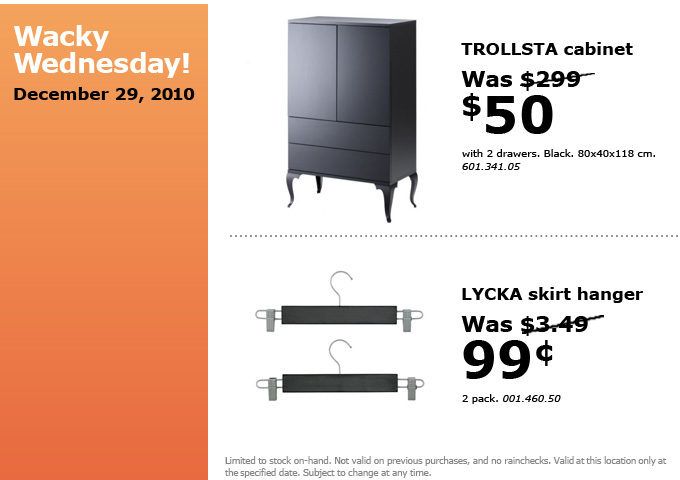 This is a limited 1-day only sale that will expire tonight at midnight (Thursday, December 30, 2010). Click here to buy now or for more information about the deal. Quantities are limited so don’t miss out! Limit 1 per person. Not valid for sale items. Must use in 1 visit. No cash back. Tax not included. Not valid with other offers. 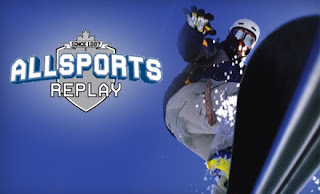 Today’s Groupon: for $25, you get $50 worth of new and used sporting goods at Allsports Replay, with locations on 83rd Street in the south or 82nd Street in the north. For nearly 22 years, this emporium of athletics has supplied Edmontonians with an arsenal of both new and quality used sporting equipment and apparel for nearly every popular sport, including lacrosse, skiing, baseball, hockey, golf, basketball, and sasquatch wrestling. Protect your noggin in the half pipe with a new snowboard helmet ($49.99), score a goal in new indoor soccer shoes ($24.99), or hit the slopes with used skis or snowboards (starting at $50). This Groupon must be used in one visit, giving you an excellent excuse to lose yourself in aisles of athleticism for hours. I just checked ALDO’s website and they restocked their website with a bunch of new shoes and styles. 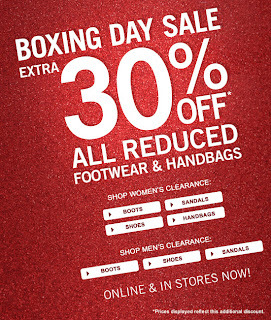 The sale is still valid and you can get an extra 30% Off All Reduced Footwear and Handbags or 50% Off select styles during their Boxing Day Sale. There’s a large selection of all types of shoes still available. The sale is available in-store and online. Click here to shop ALDO online now. This is a limited 1-day only sale that will expire tonight at midnight (Wednesday, December 29, 2010). Click here to buy now or for more information about the deal. Quantities are limited so don’t miss out! Limit 4 per person. Online only. Groupons may be combined. Tax and shipping not included. 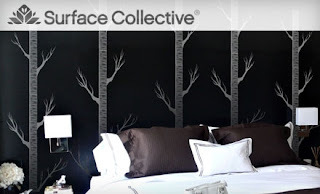 Today’s Groupon: for $29, you get $60 worth of graphic wall or laptop art from Surface Collective, redeemable online. Ground shipping usually costs around $15–$20 and is not included in this Groupon. An eclectic design collective of esteemed artists from around the earth contribute to the wide selection of easy to apply wall and laptop tattoos available through their online gallery. Ideal for the temporary renter or the eternally fickle, the wall decals add an elemental theme and a dash of confidence to any room, without forcing it to sign up for a contractual gym membership. Designs range from the abstract to the playful, with several colourful cartoon designs suitable for a child or immature husband’s room. Surface Collective has been featured in SweetMama, Schema magazine and the Georgia Straight. 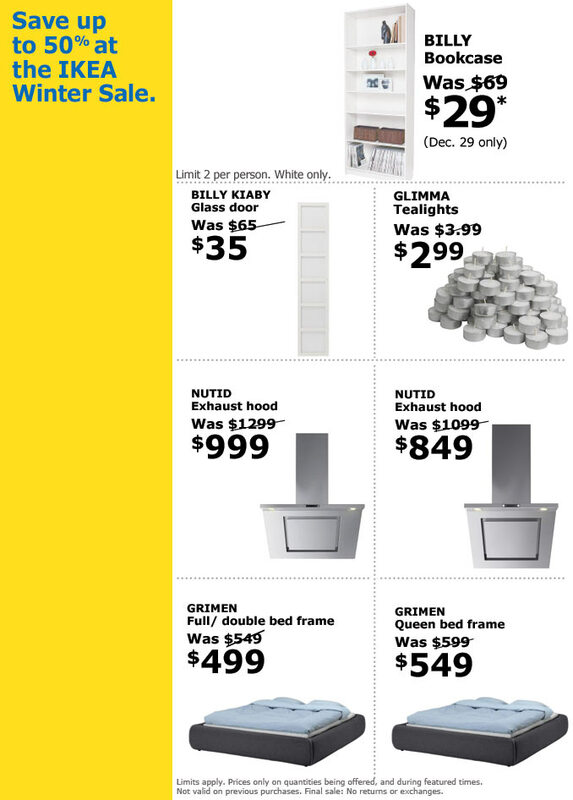 IKEA features a unique sale in each city every Wednesday. 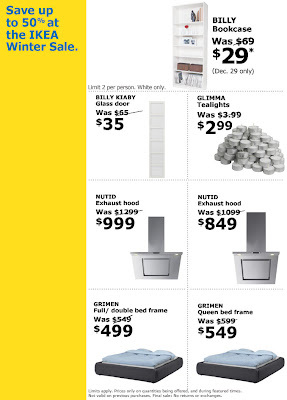 They call it their “Wacky Wednesday” huge savings deal. 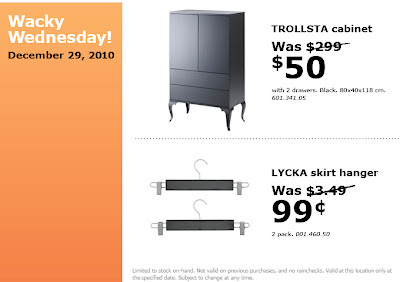 These deals are only valid on Wednesday, December 22, 2010. It’s a 1-day only sale. It is limited to stock on-hand and it is not valid on previous purchases and there are no rain checks. There’s a limit of 1 per customer. Click here to view the deals in each city. Click here for more information about the Edmonton deals. As well, you can now browse their 2011 IKEA catalogue online here or order a copy if you didn’t get one yet. 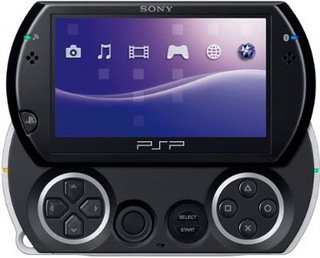 Archambault is a major electronics store in Montreal, Quebec and they currently have the Sony PSP Go on sale for only $99.99 including free shipping. This currently still retails for $199.99 everywhere. Both the black and white models are available. This is the cheapest that I’ve seen the Sony PSP Go. Here’s an huge thread of people talking about this deal on RedFlagDeals. They’ve determined that the deal is legitimate and a lot of people have taken advantage of this deal. I already have a couple Sony PSP laying around that house that I no longer play so I will be passing on this deal. Click here to buy the PSP Go on Archambault.ca.